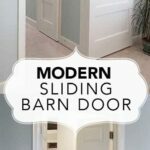 This season’s One Room Challenge was not without twists and unexpected turns. 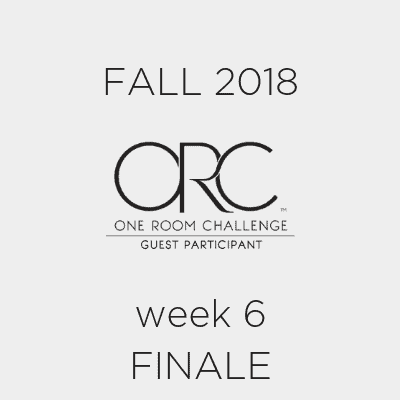 If we had talked about the room prior to the challenge, I would have said it would be a very simple, straight forward completely doable project for the One Room Challenge. 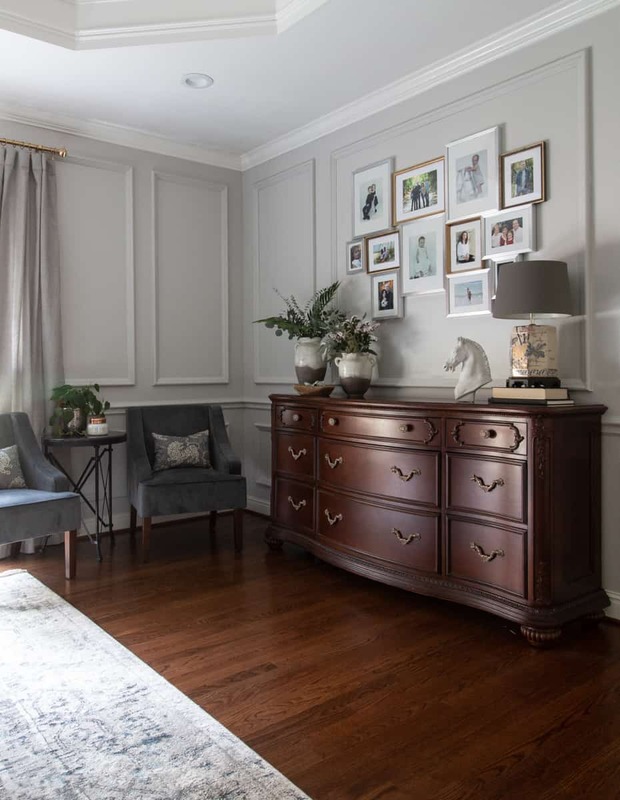 I would be remiss if I didn’t express my gratitude to Linda and the team at the One Room Challenge for inspiring so many beautiful spaces in our home. 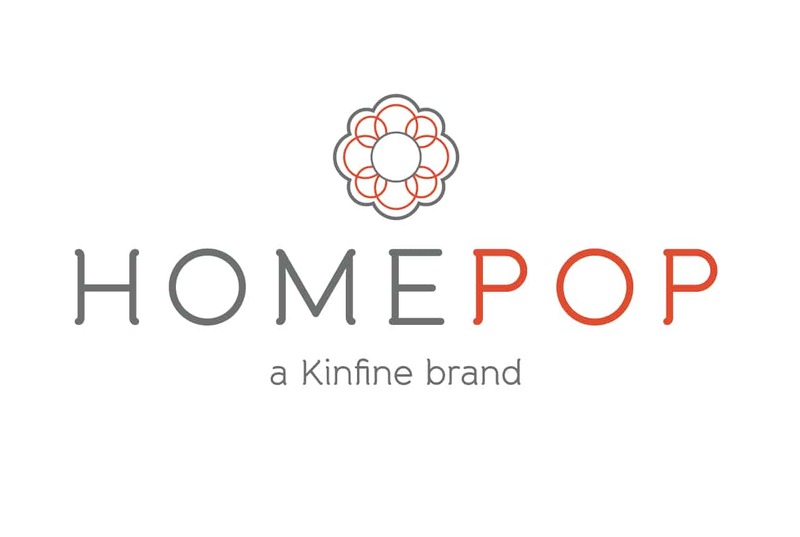 With the Media sponsor, Better Homes and Garden and the fantastic Home Love Network this is the premier bi-annual makeover event. This art is not in proper framing. The framing company made a HUGE mistake and these frames are stand-ins. I will be re-shooting the room as soon as they are fixed. 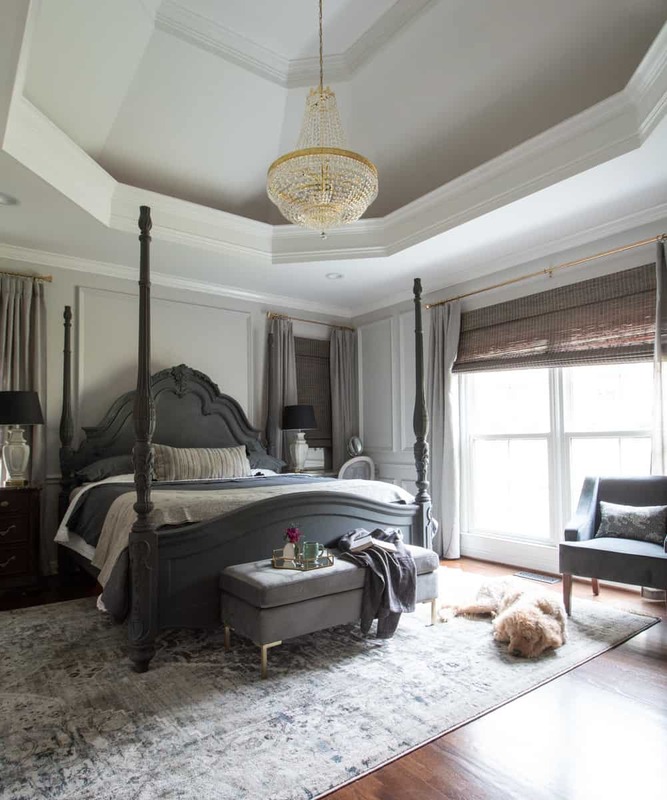 The overarching design for the room was to create a master bedroom worthy of the master bathroom we designed for the ORC Fall 2016. I would like to think I achieved that goal. 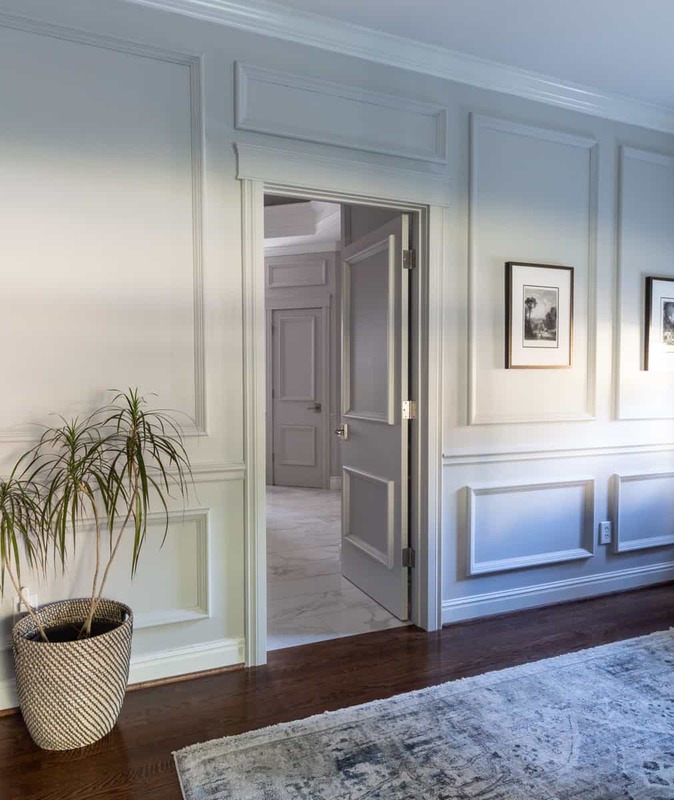 It is now a beautiful, glamorous space yet it still feels very comfortable. I love how quiet the room feels, perfect for unwinding and relaxing at the end of the day. 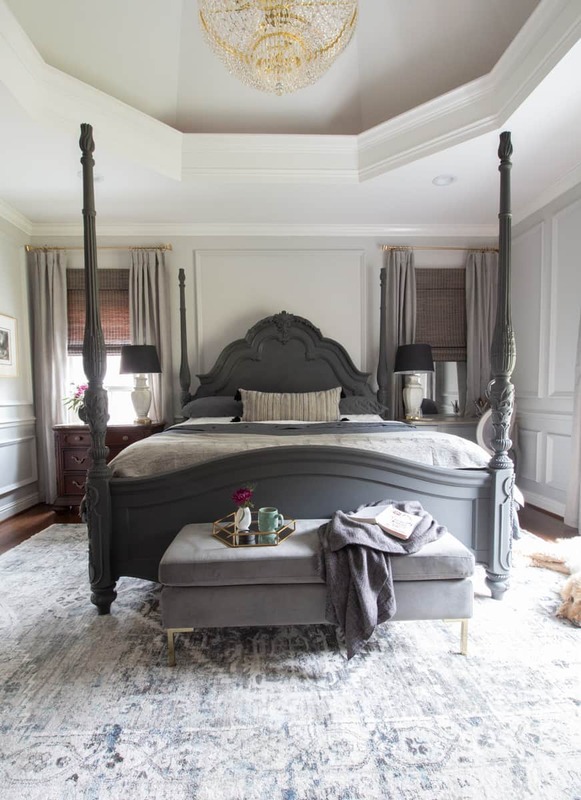 I wanted to create a room with several tonal layers and various shades of grey. 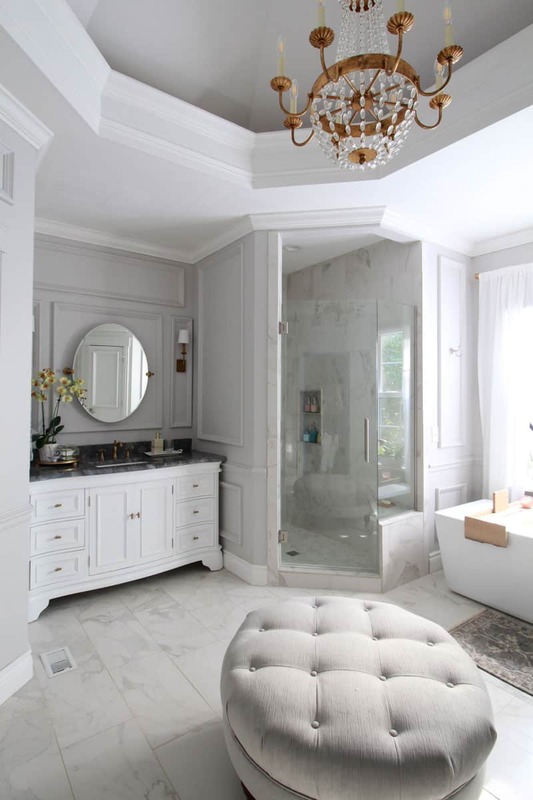 The first step in transferring the feel of the master bathroom into the bedroom was to add the exact same finishes. 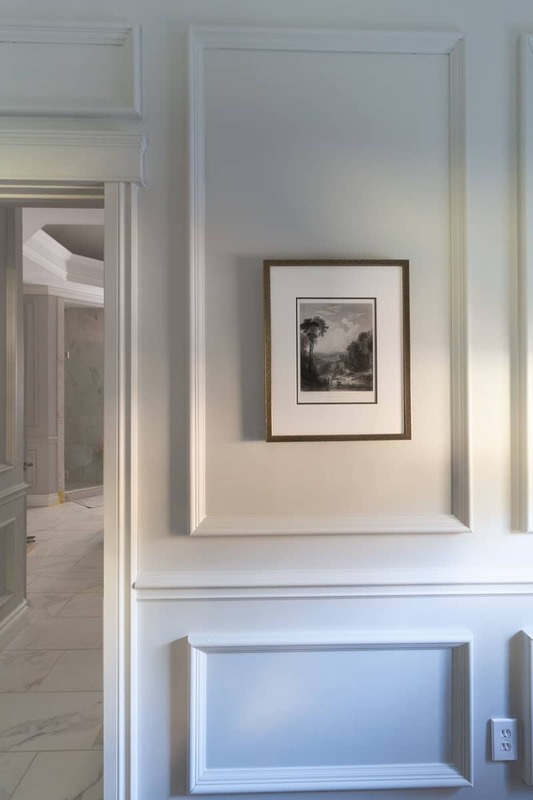 All of the panel moulding, casing and architrave were again provided by Metrie. The visual height and drama they add to the room is remarkable. 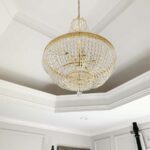 All of the moulding now seamlessly brings the eye up to the vaulted ceiling. Links below. The second most impactful change in the room was painting our four poster bed. Actually, many of the finished details you see here could not have been possible without Annie Sloan Chalk Paint. I had the extreme pleasure of meeting Annie last year and she truly has a gift for empowering women to unlock their creative potential. 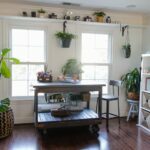 To say she has revolutionized the DIY sector is not an overstatement. I hope this room is a worthy example of this shared passion. 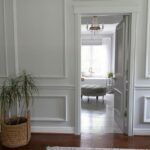 The remarkable ability to change almost anything with paint is not lost in my rooms and is always a welcome relief to my budget. 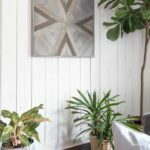 I explain the details every project I transformed with chalk paint in week 5 recap. You can find that link here. The basic layout of the room did not change. I simply removed an extra bedside chest replacing it with my vintage vanity. It now plays double-duty as a nightstand, while retaining the function for the daily task of applying makeup. The flip up mirror and conceals the clutter. Moving the vanity out from in front of the window created space for two chairs from Homepop. Link below. The clean lines of the velvet chairs are a welcome rest for the eye and perfect for a midday escape for reading or in my case, the new perfect spot for taping my Instagram Stories. With the addition of the paneling, the existing gallery wall had to be condensed. I loved the private nature of creating a family gallery in our bedroom. To wake up each morning to the smiling faces of those I love most makes me smile. I decided to embrace the feeling of compressing the frames as well as the space that was once between them. Mixing in different gold frames created even more interest. 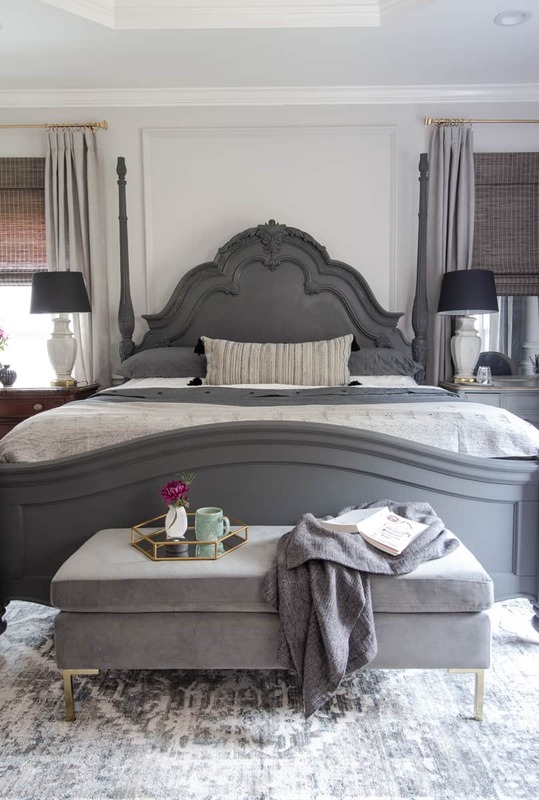 The layers of bedding are relaxed and yet very elegant. 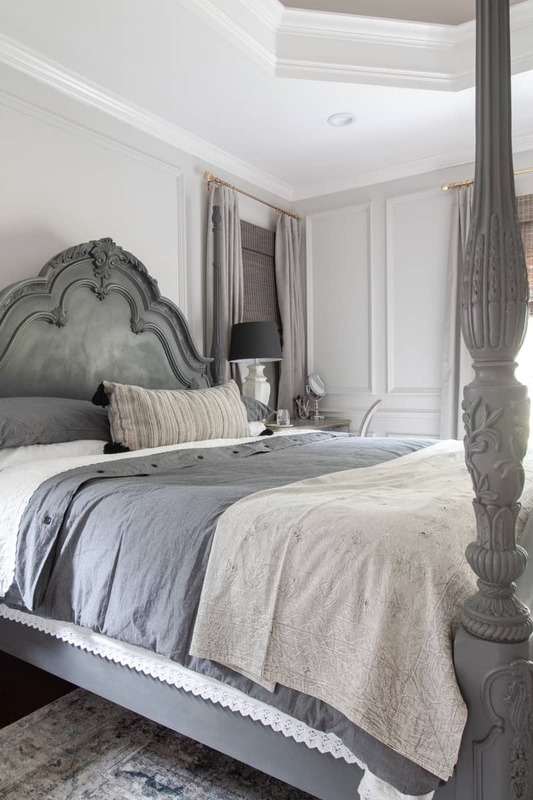 I started with a with warm, light grey sheets and then added a quilted cover with an exquisite crochet edge. In addition, the quilt provided by Laura Ashley Home is generous enough to completely cover the thick mattress. I love how it peeks out from under the soft and stormy grey duvet. I must admit the filler I sourced is light enough for our moderate Alabama winters and feels like being hugged by a cloud. I also was sure to find a set that had coordinating ties and tabs to keep the duvet from slipping down. All sources below. 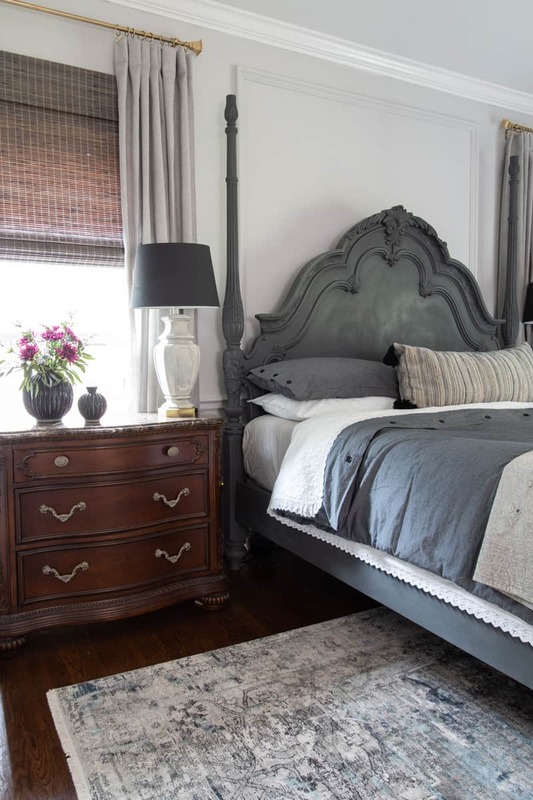 Designer fabric, from my local Calico Home, became pillows to add texture and a soft pattern to the bed and side chairs. The last details finished up right before the photoshoot was the faux window on the right and reupholstering the antique french chair. I had always been extremely bothered by the lack of symmetry in the room. To remedy the situation, I mimicked the window from the left on the right hand side of the bed. I added a mirror and lights behind the widow coverings. Unfortunately, it was a grey and stormy day so the color of the light was too warm to be turned on for this shoot. I am certain I will appreciate the additional lighting while I am sitting at the vanity too. Here is a look at the room before. Along with my sponsors, I am especially grateful to my friends who support, encourage and follow my DIY endeavors on Instagram, Instagram Stories and Facebook. I would love to have you join me there too! I have been extremely fortunate to partner with these amazing companies. This room would not have been possible without their generous contributions. 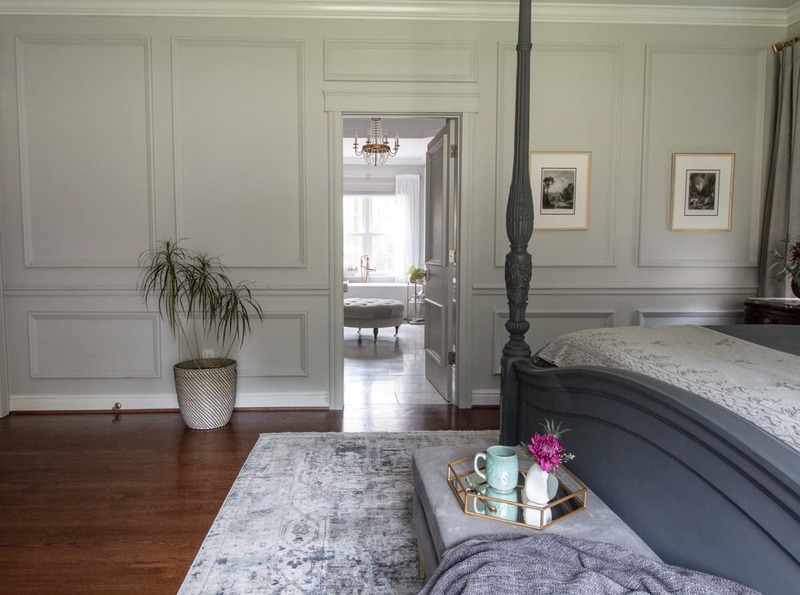 Leslie, this room is perfect just like I knew it would be. 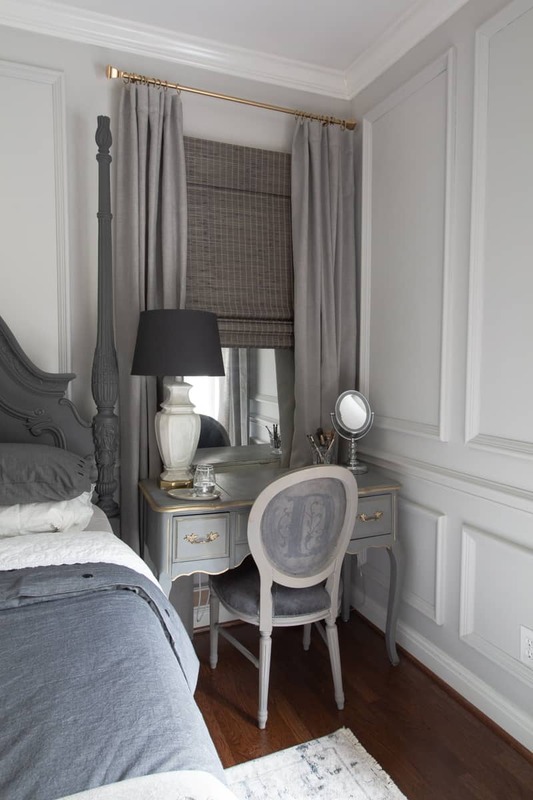 That faux window is genius and makes everything in the room right. 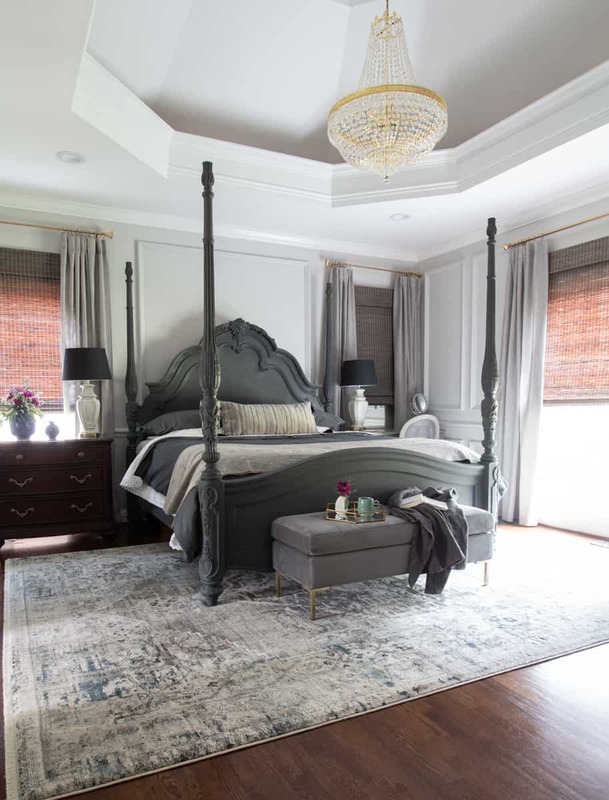 You definitely made all of the right choices because this room is stunning! I also, think the chandelier is amazing. Your room was the first room I went to because I could not wait to see it! This is such an amazing space! 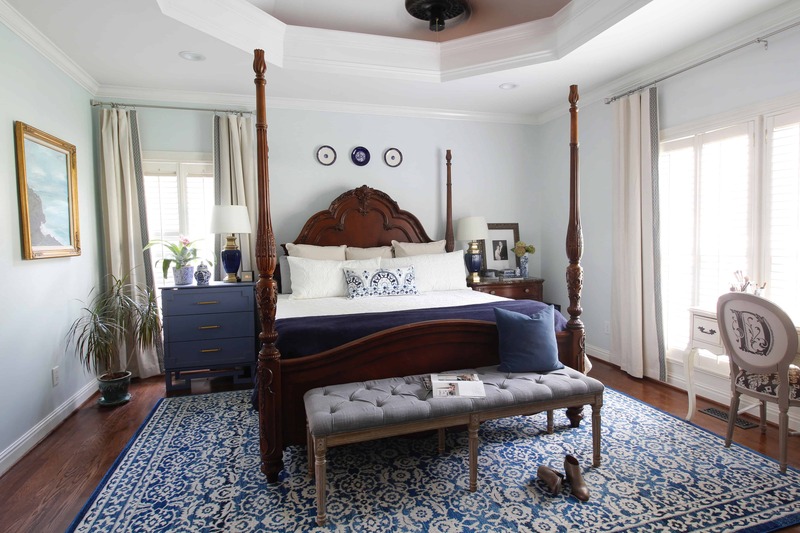 Congrats on a beautiful master bedroom makeover. 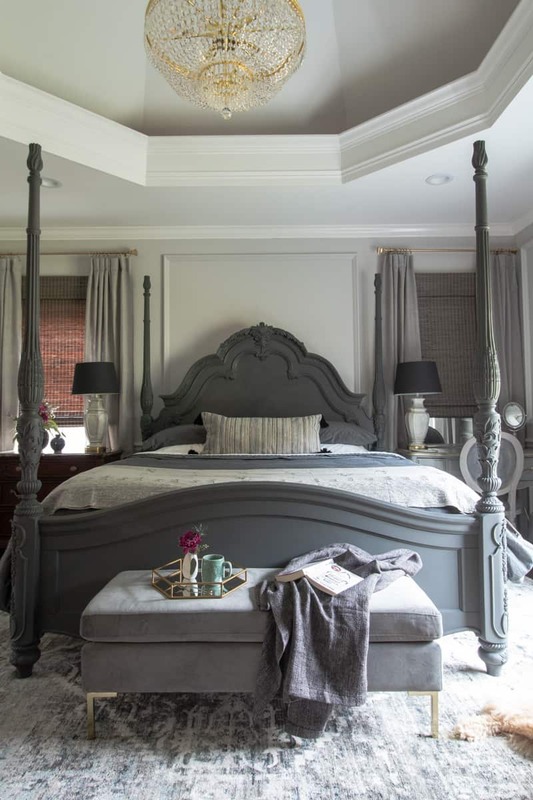 I love that tray ceiling! 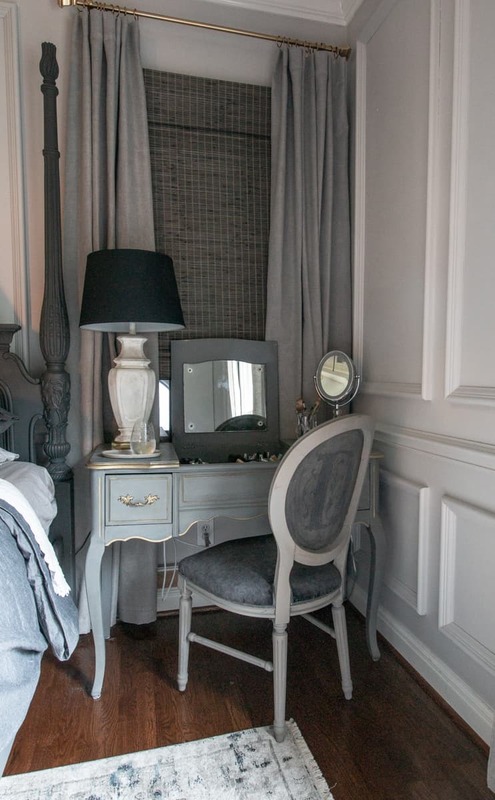 That Faux window is such a great idea! I love the color and all the layers you used. It truly looks like a serene and restful space. 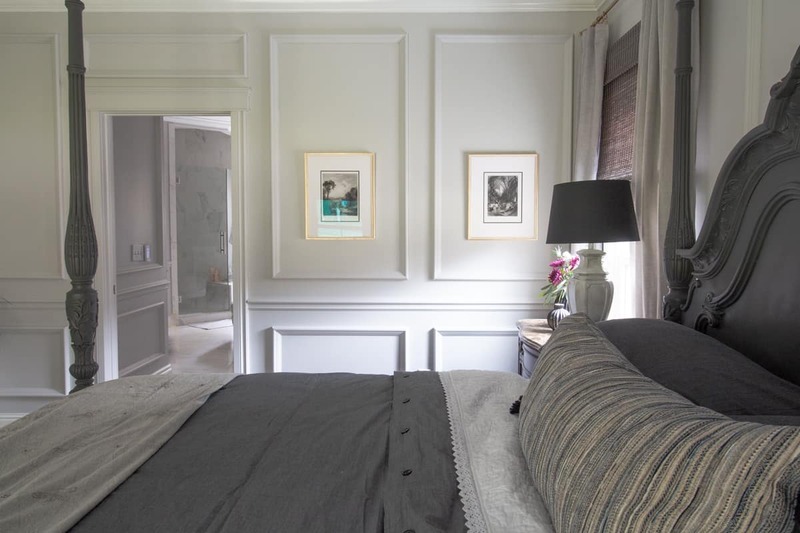 LOVE the moulding you added to the walls. I’ve had the same thing happen before where I end up having to shoot in the wrong lighting and eventually re-shoot. It still looks beautiful! Congrats on your Amara Award! Such a gorgeous room! I love how the bed turned out! It’s incredible, Leslie! The faux window is genius! And that you “painted” the curtain panels is just so smart. I know the framing debacle was frustrating. I’m excited to see the final frames! 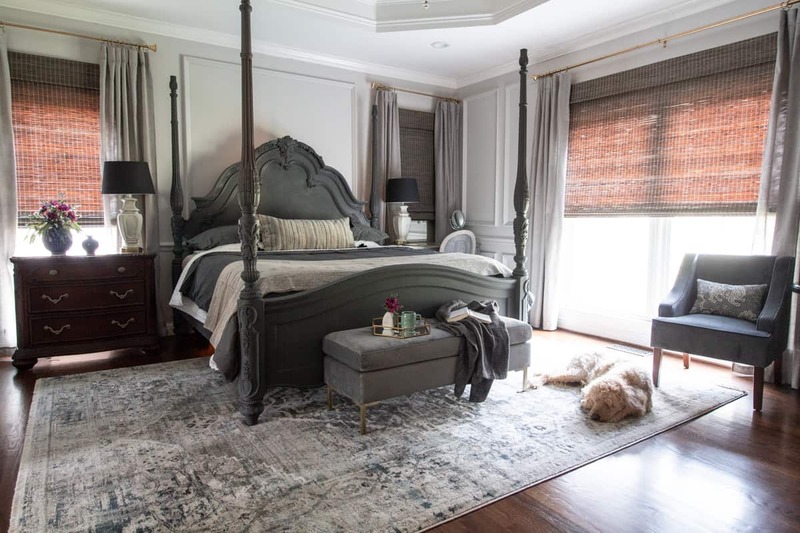 YOur bedroom turned out amazing! I love it all. 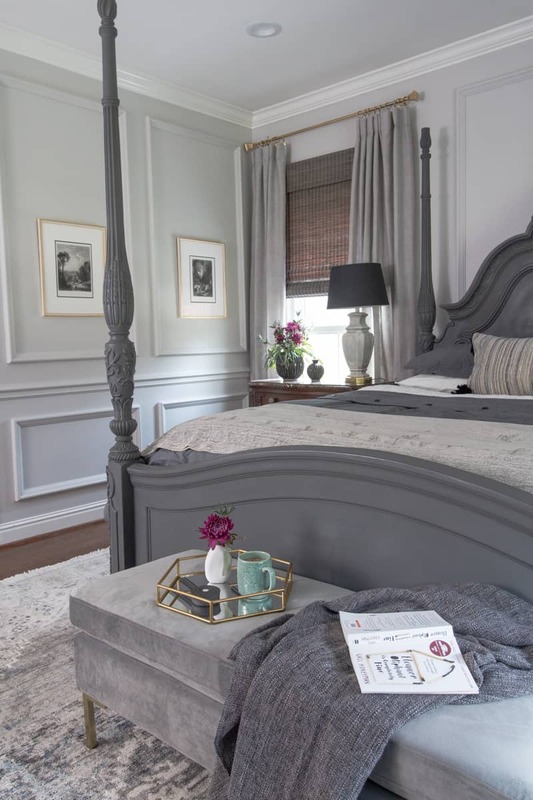 The trim totally makes the room, but so does that painted bed! It’s my favorite ORC bedroom I have seen so far this Fall!